An editor and writer’s markup pencil: the classic Blackwing 602, is available once again. Great story from The New Yorker about how fast this pencil is — its motto is “Half the Pressure, Twice the Speed.” What does it say about an editor that he’ll use a pencil as often as Microsoft Word comments? That’ll be me, sometimes, or even drafting some writing to see how it goes. Fast is better, but keyboards can be too fast at times. Maybe the Blackwing is not Just Right. 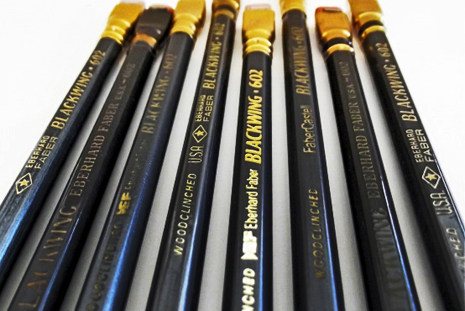 The Blackwing was first crafted in the 1930s, and is now revived. You can get yours — wow, $1.67 a pencil — at jetpens.com. Come see how this No. 1 writes at the Workshop!